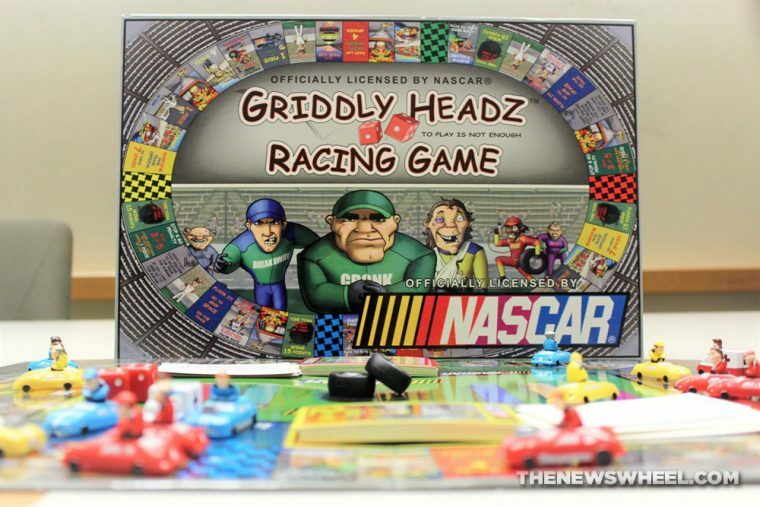 I’ve seen — and played — a lot of racing board games with my family over the years, but it wasn’t until recently that I got hold of a copy of the Griddly Headz Racing Game. I’d seen this title in passing online. Although I haven’t played any of the other Griddly Headz games, this one caught my attention because of its NASCAR licensing and automotive theme. So how does it compare to other racing games? Here’s my personal Griddly Headz Racing review. 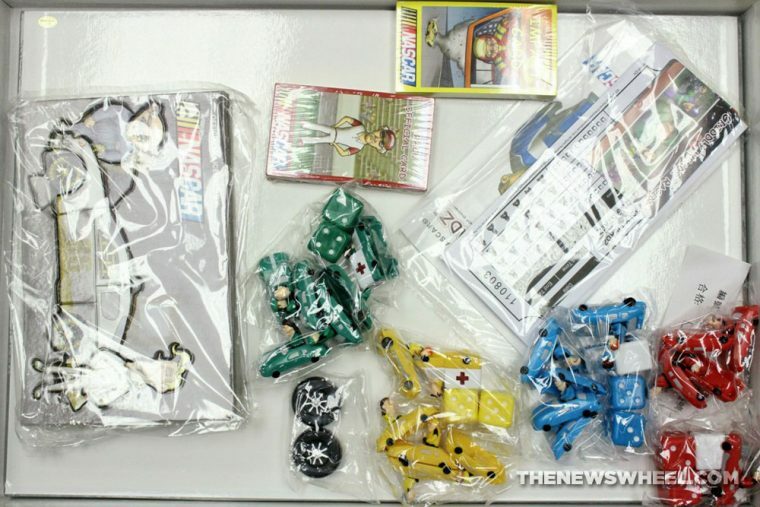 Each player chooses a color and receives the corresponding color cars, along with an individual Wrecking Yard car puzzle (used to track “health”). All cars start in their respective pit areas, except for regular car that begins on their team’s starting space. On a player’s turn, the player rolls both dice and moves their cars around the track, with the option of splitting the dice numbers between two of their cars on the track (extra cars can enter the field when a player rolls a 6 or total of 6 between two dice, allowing one car to exit the pit area). When landing on a space, the player follows the directions, often challenging another player to a dice-rolling competition for points or avoiding damage. Another challenge involves flicking rubber tires across the board. If two opposing cars land on the same space, they compete in a roll-off to take damage. The game ends either when one player earns 180 points or all other players are eliminated (either by losing all their “health” or four car tokens). Whoever is left standing or has earned 180 points is the winner. For its price, Griddly Headz Racing offers a lot of high-quality components, particularly the 24 race cars, which each are meticulously painted. 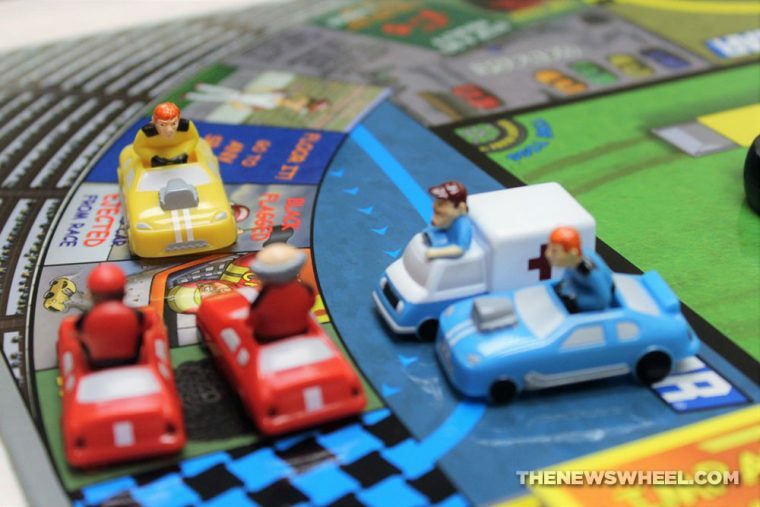 Showcasing the heads of the drivers on each of the cars adds a lot of personality to the tokens and ties in to the wacky, character-driven spirit of the game. The rubber tires are surprising hefty and a great challenge to flick. I also like the inclusion of paper score sheets, which make it easy to keep track of everyone’s points. My only critiques of the components pertain to the board. The artwork on it is very busy and visually hectic, with artistic flairs everywhere, covering every track space. Secondly, the board should be able to fold more to collapse into a smaller box. At its current size, it requires a huge box that’s a chore to find a place to store. Griddly Headz Racing also came in a deluxe edition set that replaced the cardboard track with a 3D, two-tiered plastic track and higher-quality Wrecking Yard mats. This is the aspect of the game that’s weakest and frustrates most first-time players — and I can see why. Of the thousands (no joke) of board game instruction manuals I’ve read in my life, Griddly Headz Racing‘s “Play Book” is in the top 10 worst-written. It’s not a complicated game in concept, but the way its writers explain it through the directions make even the most basic tasks near-impossible to comprehend. The rules are written out of order, points are omitted initially that are nonchalantly referred to later, and it redundantly covers minor points multiple times. The rules definitely needed more editing input. I’m not familiar with the rest of the Griddly Headz games, so I can’t compare this to the publisher’s other sports titles, but Griddly Headz Racing reminds me of a more aggressive Parcheesi or dice-based Sorry. At its core, I like what Griddly Headz Racing is trying to be: a motorsports game that consists of head-to-head battles rather than competing an arbitrary number of laps first. It feels more like a simplified, vehicular area combat game. 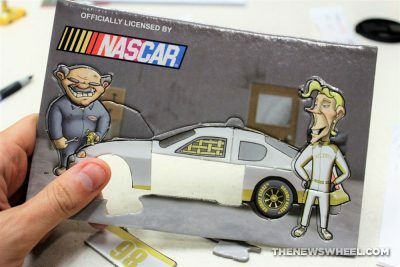 Frankly, that’s a pretty sweet idea for a NASCAR-licensed game. 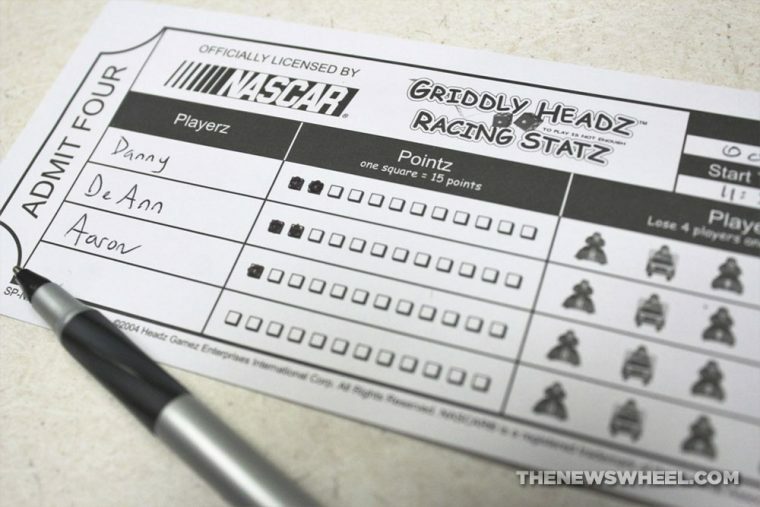 Unfortunately, Griddly Headz Racing has too many flaws that inhibit it from being a fun experience: There aren’t enough ways to earn points, the spaces on the board are underwhelming, and the dice rolls make everything completely random. Once you’ve finally understood how the game works, it begins to feel repetitious. If you pick up Griddly Headz Racing at a thrift store and are willing to learn it, you could have a decent experience playing it — with some house rules. In my opinion, while I appreciate the goofy personalities and artwork instilled in the game, there are other car racing games on my shelf I’d rather play with my family. 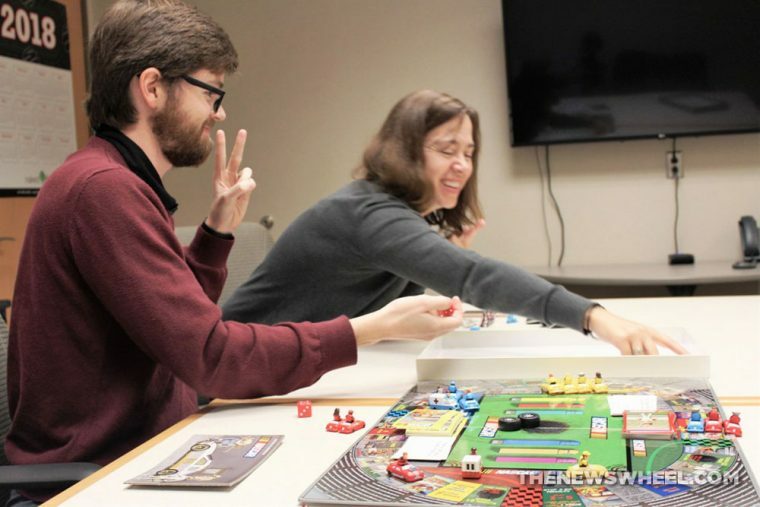 Since releasing the Griddly Headz line of sports games, the company has rebranded into a producer of STEM games and educational kits, and I think it has a much more promising future on that path. Griddly Headz Racing is out of print but can be found through online marketplaces. Aaron is unashamed to be a native Clevelander and the proud driver of a Hyundai Veloster Turbo (which recently replaced his 1995 Saturn SC-2). He gleefully utilizes his background in theater, literature, and communication to dramatically recite his own articles to nearby youth. Mr. Widmar happily resides in Dayton, Ohio with his magnificent wife, Vicki, but is often on the road with her exploring new destinations. Aaron has high aspirations for his writing career but often gets distracted pondering the profound nature of the human condition and forgets what he was writing… See more articles by Aaron.